The New NeoClassical XL is my recent customization of this theme, an eXtra Large Edition of The original, with Horisontal Drop-Down Menubar and enough space to fit in a 480px widescreen Youtube video in the content area. 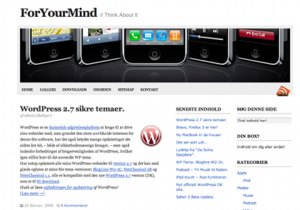 This Theme is ready for WordPress 2.9+ and tested with Safari 4, FireFox 3+ and IE7+ webBrowsers on Mac and PC. Download NeoClassical XL (English version). Dette indlæg blev udgivet i NeoClassical 2R (EN), NeoClassical XL og tagget 3 Coloums, NeoClassical XL, WordPress, WP 2.9. Bogmærk permalinket. 11 Kommentarer til The New NeoClassical XL Theme for WordPress. The free new NeoClassical XL theme is now ready for DOWNLOAD! I love it! I’m using the old Neoclassical WP theme, which I loved. I want this one. Thank you. hi. I can’t figure out how to activate the Neoclassicl XL file. I’m new to WP and can only change the theme if it’s in a ZIP-file. Hi Christian, U should be able to activate the NC XL1 via admin/themes/ in the admin menu. When I activate NC XL the whole template gets lost. I can activate the NC theme that is downloaded as a ZIP-file but when I activate “Neoclassical%20XL-EN”-file it’s not working. You have to unpack the ZIP-file before upload. Then U transfer the complete NC XL directory via FTP to your: /wp-content/themes. Which Host do U use? The problem is when I download the file my system does not recognize it. Is it a ZIP-file? or do I have to pack it a ZIP-file? The other themes I have downloaded are all ZIP-files and are easy to up-load via the WP theme upload. Sorry, the file on the server is not zipped. I just send U a mail with a Zipped file.